Pabst Milwaukee Brewery's street party this weekend signals more than just the grand opening of a brewery. It's about a resurgence in an area that was once left for dead. After closing in 1996, the massive Pabst Brewery sat as decaying reminder of Milwaukee’s rich brewing history. At that point it was hard to believe that 20 years later the Pabst complex would become a bustling hub on the outskirts of downtown. The addition of spots like Best Place (901 W. Juneau Ave.), The Brewhouse Inn and Suites (1215 N. 10th St.), and a few offices and apartments brought life back to the area. And, when Pabst Milwaukee Brewery (1037 W. Juneau Ave.) opened on April 14, brewing finally returned to the Pabst complex. The fact that beer is being brewed there again is the result of a brewing landscape that is drastically different from the one that existed in 1996. Back then, there were just 1,149 breweries in the United States, according to the Brewers Association. In the late 2000s, a craft beer boom began and allowed smaller brewers to find success. That trend boosted the number of breweries to a whopping 5,301 by the end of 2016. Pabst Milwaukee Brewery fits into the small brewery category with a relatively modest production capacity of around 4,000 barrels a year. 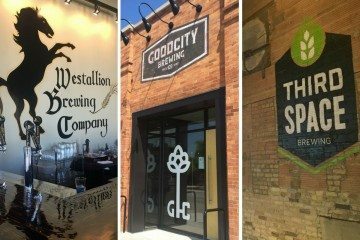 The brewpub celebrates its grand opening, and in a sense the renaissance of the area, with a street party on Saturday, May 13. The free party lasts from 1 to 7 p.m. and includes food, beer and live music by the likes of alternative hip-hop pioneer, Arrested Development. Pabst will be pouring four beers at the party—Forst-Keller, Nor’Eastie Boys IPA, Not a Kid Anymore Maibock and Bier de Mars. The street party takes place on Juneau Avenue, in front of the brewpub, which is housed in a 144-year-old building that has served as both a church and a tavern for Pabst employees. The Nor’Eastie Boys IPA may be a popular tap choice for present-day beer fans, but if you make it into the brewpub try an Andeker, a classic Pabst recipe that has been resurrected. “[Andeker is] an incredible lager, modeled after the famous Andechs Brewing Munich helles, and a must try when you visit the taproom,” said Tom Ciula, local beer guru and certified beer judge. Next ArticleStone Creek Coffee is Opening Another East Side Location!